ATIMA is a professional outdoor power supplies brand, ATIMA knows what's the most practicle accessories fits generators. "ATIMA outdoor power accessories quality was proved by true test on generators, designed in most simple and considerate way. ATIMA considers more on safety and practicability, pursuing to let all users enjoy the reliable products with best price. Weather-proofing matierals, oil and moisture resistant, cold and heat resistant, these features makes AGC101 can be used at some extreme situations. Running power up to 3750watts and Three 15-amp outlets guarants that several of your important appliances get powered at same time. 25-feet long cord gives you extra length to power your appliances in a distance, which keeps you enjoy the power supply in a more comfortable,quieter place. 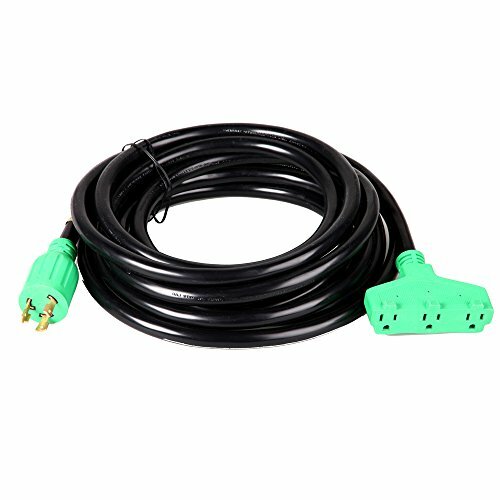 AGC101 generator cord fits all generators under 3750watts running power, it is an ideal extension power cord you will need no matter at house power outage, outdoor camping, or RV travelling. FBA delivery assures you get commodity faster and in better condition.